Wireway/Husky is the only RMI certified company to manufacture rack and wire deck together. Wireway Husky also provides technical and engineering support across and extensive product line that uses numerous punch styles and sizes to meet customer needs. 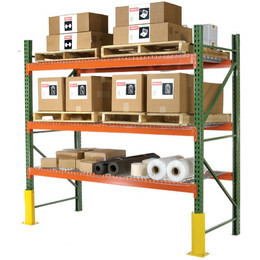 The Wireway husky line of invincible pallet rack features brands synonymous with quality in pallet rack industry for more than 48 years. Upright frames are available in both 3"x1-5/8" and 3"x3" posts with heights up to 46 Ft. The teardrop pattern is an industry standard and accepts most style beams. Beams feature the patented Bowlock stafety clip. Bowlock cannot be sprung or removed withouth first removing the load and requires no special tools. Standard colors are green upright frames with orange beams. Call for other color options.